Here's my entry for the Weather compo 2015! Nice use of fog and rain. I also like the detail in the buildings. I won't spoil the ending, but keep watching until the credits at the end for a cool effect! Very well done mate i like it a lot. Great choice of tune too. Excellent rainy cityscape, very nice style. Music worked really well and the end effect was great! Runs fine here. Cool entry rbz! A bit depressing though. The notebook that I have coded this one is really weak (amd e1 7xxx... something), and I was on it's limit, ie until it would drop some framerate. 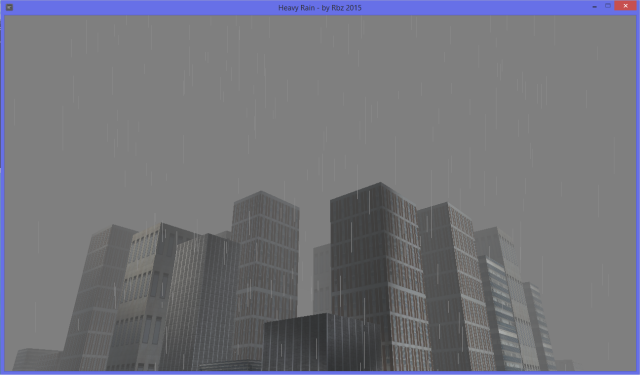 Anyway it worked on intel hd3000 and I believe it was opengl 3.1 and glsl 140. Take a look on the console window, there is some shader log and info about your opengl/glsl version. My actual PC it's a 2007 Core2Duo T5500@1,66GHz win Intel GMA945/950 notebook with 4GB-DDR2@667MHz, 1TB HDD, Windows XP... I WIN! Awesome entry, ran well on my laptop. Were the buildings made algorithmically? @spitfire : Thanks, they are just cubes and each one have their own random scale property that I can pass to the shader program. Wow, what for a cool intro! I really love the city scene with its atmosperhe and its great music! Very cool idea and smooth execution, rbz! Respect to the musician for the groovy tune which fits really nice to thie demo! When i thought the demo is over, i was very suprised by the damn cool light-cycling effect and the greetings part! Btw, thanks for the greetings! Yeah I intend to go back to square one and start all over again... It will do me good.